Imagine having oodles of fun whilst meeting new people! There is always a great mix of friendly people on our events so if you are in the mood to try some new activities, then this is the event for you. Want to meet people and try new activities? Our priority is to make sure people have fun and make new friends in a safe friendly environment. Your host will text you in advance to ease any nerves, welcome you and introduce you to other members, as well as being on hand to ensure you have a great time. Join us on the streets of Manchester which will turn into a hive of activity this April as thousands of local people – and bees – take on a 10km moonlit challenge in support of St Ann’s Hospice. The sponsored Manchester Midnight Walk, is back for its thirteenth year, and will take place on Friday 26th April. The event starts and finishes at the beautiful Manchester Cathedral, and this year we’re encouraging as many people as possible to embrace the bee theme! 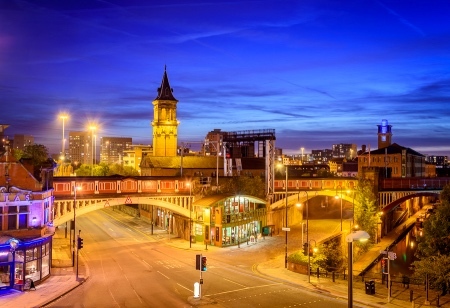 The 10km route starts at midnight and takes in some of Manchester’s most famous landmarks including the Hilton Hotel, Old Granada Studios, Spinningfields, MEN Arena, the Northern Quarter and past the Universities. The route is fairly flat and on footpaths and ends back at Manchester Cathedral. Your host Ruth will meet you at Manchester Cathedral which is open from 9pm, where you can join other walkers & enjoy the evening’s entertainment including performers, stalls and a Zumba warm-up. You can also decorate your official t-shirt, and collect your goodie bag full of freebies and supplies to help you on your way. The walk includes a Memory Garden, where you can leave a message in memory of a loved one. As you cross the finish line you can collect your medal to celebrate your achievement! Please note: the early bird rate ends 28th February and prices will go up to £21 for adults. Going to a music festival was one of my ‘bucket list’ activities to try. Admittedly I had something like Glastonbury in mind but when I saw a local music festival on the calendar I signed up straight away. I had a lot of fun. Thanks for a great time. Julie. I have never been to a murder mystery party, and wasn’t sure whether it was my cup of tea but I was roped into it by other members. It was a fun evening with plenty of laughs. I would definitely recommend giving it a try. Pete.